Michigan’s premier lemon law attorney, Dani Liblang will speak on Tuesday September 29th at the MAJ No-Fault Institute in Southfield regarding claims that can be brought against manufacturers, dealers and repair facilities whose misconduct subjects a person to economic or personal injury. In the practice of lemon and consumer law, rapid advances in vehicular technology have changed the playing field and we as attorneys need to know how to respond accordingly. 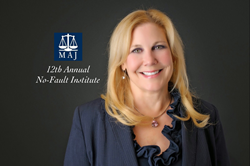 Dani Liblang, founder of The Liblang Law Firm will join some of Michigan’s leading law firms as a presenter at this year’s MAJ No-Fault Institute XII “The Stuff You Need to Know” to be held at the Westin in Southfield. The Michigan Association for Justice, (MAJ) is a prominent, statewide organization of 1,700 members, dedicated to the preservation of civil justice. For over seven decades, MAJ has organized seminars, forums, document banks, and a library of publications helping dedicated members advocate for their clients. MAJ’s advocacy work in Michigan’s Capitol makes certain that those who place profit over people cannot tilt the scales of justice in favor of the rich and powerful. The MAJ has conducted the People’s Law School program, which has taught tens of thousands of Michigan citizens about our legal system and their civil justice rights. The MAJ Helmet Safety Campaign has fitted more than 22,000 children with bike safety helmets at over 100 events all over the state, earning MAJ recognition from the Governor, the Legislature, and mayors of cities across the state as well as the police and public safety community. Dani K. Liblang is the founder of The Liblang Law Firm, PC, a consumer, lemon law and personal injury firm serving clients throughout Michigan and the Detroit metropolitan area. She was recently named to the Top 100 Trial Lawyers of Michigan. The Liblang Law Firm continues to represent plaintiffs in personal injury, product liability, finance fraud, and toxic tort, as well as a variety of consumer law issues. Additionally, the firm is extremely active, well versed and certified in Alternative Dispute Resolution (ADR), which allows clients to pursue non-traditional litigation methods such as arbitration, mediation, mini-trials and private judging.